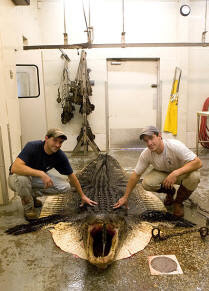 The online registration for SCDNR's drawhunt for alligators starts May 1 and ends June 15th. Alligator season will be Sept. 12 to Oct. 10th. Send in some of your pictures from last year's season and I'll share them here! Rachel is about a month old. She's an orphan calf that we've been trying to introduce to a bottle for about a week. After much slobber and sore toes, it worked! Rachel's finally learned to drink from a bottle! We make our own feed from locally grown corn and hay we bale on Wadmalaw Island.